The Buck 110 lock back folding hunter is one of the most iconic folding pocket knives around and is now available in the Slim Pro version with premium material upgrades and a thin, lightweight construction. The Slim Pro version premium upgrades include Paul Bos Heat Treated S30V and OD Green Canvas Micarta handles bringing the 110's performance to a higher level. As always, the Slim Pro 110 is proudly Made in the USA and backed by the Buck Forever Warranty. 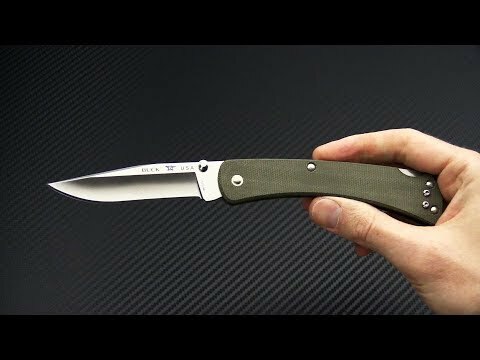 Brand new item directly from Buck Knives. Blade: The Cryogenically Heat Treated CPM S30V in the iconic clip point profile is useful for just about any cutting chore. The hollow ground blade is a slicing machine and S30V delivers excellent edge retention and corrosion resistance. Dual thumb studs are provided on the blade for opening though the blade is also easy to open with a pinch grip upon the blade as well. Handle: The profile of the 110 is maintained but the heavy bolsters and handles have been replaced with simple yet robust OD Green canvas Micarta handle scales delivering a slim profile in the pocket and a sub 3.5 oz. carry weight. A perfect blend of classic design and modern construction for every day carry and use. A simple back lock mechanism provides solid and secure lockup for use. The back lock, thumb studs and pocket clip make this knife fully ambidextrous. Carries via a removable, reversible deep pocket carry stainless steel pocket clip. CPM-S30V: A martensitic, powdered stainless steel with high levels of wear and corrosion resistance. Its chemistry promotes the formation and even distribution of vanadium carbides, which are harder and more effective at cutting than chromium carbides. This gives it a very refined grain, further improving the sharpness and toughness. S30V is a great, all around steel with high levels of performance.